FYI: The Old Man of the Mountain was a series of cliff ledges located on the side of Cannon Mountain (in the White Mountains of New Hampshire), that, when viewed from the north, appeared to be the jagged profile of a face. You may have seen it on the New Hampshire quarter. However, it collapsed on May 3, 2003. FYI: The Kancamagus Highway is a 34.5 mile scenic drive along NH’s Rt. 112 in Northern New Hampshire and you guessed it – it’s windy. Sorry for the glare on some of the pictures. We were seated near a window and I was too chicken to ask the people seated by the blinds to close them so I could take pictures (they looked grumpy). The Van Gogh is my favorite, which is yours? Lol – I like “cubism”! Very cute. The Rhode Islander almost made me spit out my coffee. They are all cute, but that one is hilarious. LOL! I really like the Salvadore Dali and The Van Gogh ones! THey are all really cute. Gotta love a place with a sense of humor. Haha The Rhode Islander made me chuckle. These are great. These are sooo fun! The VanGogh and Cubism both made me laugh! The Rhode Islander is one I definitely wouldn’t want to order!!! I like the “Rhode Islander”. hilarious. The Old Man of the Mountain, of course!! That is hysterical! I never thought to do that with my son! I especially liked Rhode Island! How creative! I love it when restaurants have amusing decor! Also, I’m now making french toast for supper tonight! I think the The Kancamagus Highway is my favorite! Not your typical pancake, but I think it would be fun to eat! I like the rhode islander. or the kanc ! Salvadore Dali is funny lol i like all of them though very creative lol. Some of those were really fun! My favorite was Cubism! LOL. The Van Gogh is great. Could go for that French toast right about now! Sounds wonderful! That is such an awesome collection! lol. My kids always ask me to make shapes out of our pancakes, but I’m no where that good! lol. What a fun place to go out to eat! Too funny! I like the Van Gogh one as well. Your mention of french toast has me craving it now – haven’t had any in forever! These are cool, I never thought of anything like that! I am sharing this with a few friends! The Salvador Dali cracks me up! But the Van Gogh is excellent, especially for it’s #hiddenmickey! Hilarious! I always love reading your blog bc I can relate to so many sites. We were just at Loon and just ate at flapjacks!! These are hilarious! Love the Dali one! I like WC Fields. How funny are these! They certainly know how to have fun! I really like the Van Gogh, but they are all really funny! That seems like such a cool place. I appreciate any place of business that has a good sense of humor. i am the only weird one that don’t really care for pancakes, but still that is seriously cool. These are really weird, yet cute. I like Van Gogh the best. As Liz Lemon would say, I want to go to there. I love a place with pancakes and a sense of humor. The Dali one is the best! This cafe looks great! I have been to Lincoln a million times and never heard of this place! I like the Rhode Islander. That’s pretty clever with its itty bitty self. They are all really fun, but I think I like the Dali best. What a neat and unique idea! Oh My Gosh!! These are so cute! I have never had a WC Fields Pancake! So CUTE~!!! Love the Old Man in the Mountain. I was lucky to make it to New Hampshire before it fell. Very clever interepretation. How funny! There is a Flapjack’s chain in Gatlinburg, TN that we love eating at when we go there. They don’t have cool pancakes like this though! I have never had Salvadore Dali. Don’t think I’ve ever heard of it prior to this post. Those are some fun pancakes! I love quirky places like that. Thats hilarious! I practically ate the phone when I saw your french toast! Love pancakes and french toast! I think it would be great to eat here and look at all of the pancake art! That’s awesome! I am going to have to check this place out if we get up to Lincoln this Summer. Too cute! My kids and I were doing a history lesson and they showed some pictures of Plymouth Plantation. Thought of you and your blog when we read that! I’ve really been enjoying reading about all the fun, different places that you go and experience. Your area has such a rich history! Ha, this is awesome! The Rhode Islander is cracking me up. This place is super cool!! I love how microscopic the Rhode Islander is!! So fun! Your posts seriously make me want to visit NH. I like the Dali one; I’m a fan of his anyway, though, so I may be a bit biased. Very creative!! I actually like all of them! Definitely got my mind going. Those are all very cute. WHo says you can’t play with your food? Ha – the Dali one for me. It looks like a pancake I’d actually make. I cannot wait for maple syrup season now!!! There are so many places up here where you can go an watch the trees be tapped, the syrup made and they all have restaurants that serve up huge stacks of pancakes with fresh Canadian Maple Syrup! Very funny! My husband made us pancakes last night and served up a few “snakes” and “plus signs”. I think they are all adorable. They each have their own sense of humor. The Van Gogh one is definitely my favorite! Who even knew there was pancake art…so funny! I do love me some pancakes though, AND french toast! A very creative way to make something you love to eat look like art. I love it! Now these are totally cute – I love them all! I’m sure that their pancakes and their French Toast are delicious. I love going to specialty restaurants like this one. LOL, how cute are these. The pictures turned out great even with the lighting issues. I probably would have to go with W.C. Fields as my favorite. The Red Sea is fun and something I could even make at home. Fun place to visit! LOL! This is such a fun post! Who knew pancakes were so funny. Hysterical! I’d take a Van Gogh please. That’s neat! I like the Rhode Islander. I bet your kids loved looking at them! Look at all these different shapes and sizes.. I never thought that pancakes can be made with such creativity :).. The Salvador Dali is my favorite! I see people making things out of pancakes all the time, so artistic! Those are all very cool. It made me laugh. I like the Salvador Dali! All of them are very funny though! When I was reading this and came across the Van Gogh, I thought to myself. I bet that is Robins favorite… I was so right. I think I like it best too. Those are so interesting! I’m not sure which one is my favorite! LOL!! Those are really funny! 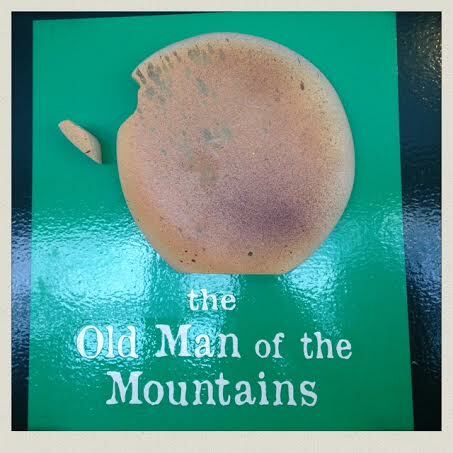 I love the old man on the mountain!! Those are hilarious! I always love the creativity when people play with their food. My pancake art would look like the Rhode Island one because I’d probably eat it before I actually made something! Great!! Now I can call my mis-shaped pancakes art. I put a lot of Van Goht and Dali pancakes on our table. Too cute. Oh those are all awesome!! !